The chairperson of PPCC Board of Commissioners, Cllr. P. Teplah Reeves, says adherence to the rules and regulations governing the conduct of public procurement is germane to the fight against corruption in the public sector. She warns that unless Liberians, particularly public officials entrusted with power and management of public resources uphold the tenets of good governance, the attainment of Liberia’s development goals will be seriously challenged. Cllr. 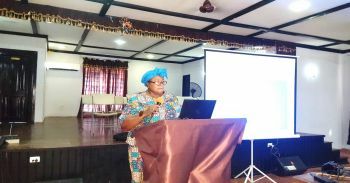 Reeves made the assertions on Monday, March 25, 2019, when she addressed participants during a four-day procurement and corruption prevention workshop held in the auditorium of Booker Washington Institute (BWI) in Kakata, Margibi County. The workshop was jointly held by Public Procurement and Concessions Commission (PPCC) and Liberia Anti-Corruption Commission (LACC), with support from United Nations Development Program (UNDP), through its funded project, Strengthening Transparency Accountability Oversight and Participation (STAOP). She assured the participants of Government’s unflinching commitment to working with partners and various stakeholders to strengthen the procurement capacity of public officials, so as to increase effectiveness and efficiency in public procurement. 44 public officials from Gbarpolo, Bomi, Grand Cape Mount, Montserrado and Margibi Counties attended the event. The Kakata workshop was preceded by two others simultaneously held in Ganta, Nimba County and Zwedru, Grand Gedeh County on March 18-19, and 18-21, 2019 respectively. The participants from the Ganta workshop were mainly local authorities of Grand Bassa, RiverCess, Lofa, Bong and Nimba Counties, while those that attended the workshop in Zwedru came from Grand Kru, Maryland, Sinoe, RiverGee and Grand Gedeh Counties. The included county superintendents and their deputies, county procurement officers and chairs of Project Management Committees, administrators and procurement officers of community colleges, health sector, as well as city mayors. The workshop was held on the Theme: Strengthening Transparency and Accountability in the Local government through Procurement Compliance and Corruption Prevention It can be recalled that in January 2018, a new government headed by President George M. Weah, commenced implementation of various mandate areas and responsibilities. Key among the responsibilities is compliance to the Public Financial Management Act which requires that all purchases of goods and services be made consistent with the Public Procurement and Concessions (PPC Act). This requirement, as mandated by the law became a serious implementation challenge to the new officials. This is so because many of the newly appointed officials had limited or no knowledge on the existence of the various pieces of legislation on public procurement and corruption prevention. Implementation of various mandate areas got stalled as a result, while demands for the provision of basic services increased. A remedy was sought under the United Nations Development Program’s (UNDP) funded project, Strengthening Transparency Accountability Oversight and Participation (STAOP), to mitigate the challenges, so as to increase public awareness of the benefits of a well-functioning Public Procurement System, as well as increase compliance to the PPC Act and all subsidiary documents on public procurement.